I wasn't a huge fan of part 1 of The Wake. It was okay but I couldn't really connect to any of the characters. It did, however, do a great job in setting up the landscape and history for part 2, which starts with issue #6. I really enjoyed the pacing of this story and discovering more of the little details that make this world unique. The main character is this spunky young woman. She illegally fishes for mer-men heads and sells them. She collects radio parts which also happens to be illegal. I'm sure I'll be able to remember her name eventually because right now it's not coming to me, but that always happens to me when I'm introduced to new characters... Okay, I looked it up and I believe her name is Leeward... The world has been overcome by the oceans and the mer-men and this woman is desperate to find a voice that will tell her how to right the world. One of my favorite scenes is the one with the political figures discussing the national bird of the United States and why it needed to change from the bald eagle to the crane with really interesting ideas that show a lot about the state of the nation without getting too verbose. Oh, I have ONE nitpick. The coloring of the lettering that shows the different locations was very difficult to look at and read. It needed a bit more contrast between the white letters and that pale background. That might have been something that looked good on a monitor but in print, it did not translate into being clear. The artwork is really beautiful from the settings to the characters. I think the main character is a cool, tough woman, and I always enjoy reading about strong female characters. 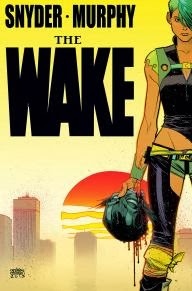 And I enjoyed how the end of the story connected back to part 1 of The Wake, too. It'll be interesting to see how this young woman will come to cross paths with the other characters introduced in this issue. They're worlds apart right now, yet they're all connected.